is the church a destination or a vessel? Because I identify as queer, all of my previous posts on the YMF blog have been about queer issues in the Church. Today I have decided to write about the repercussions of Kate’s excommunication—not because it is a “hot topic,” but because it highlights a growing problem that I see in the Church, a problem that affects whether or not there really is room for me in this Church. 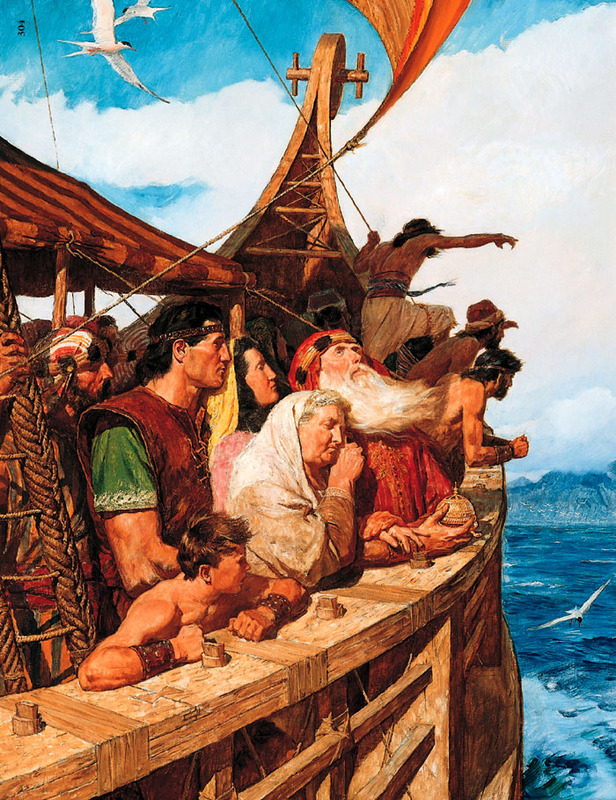 This problem can be addressed with a simple question: is the LDS Church a destination, or a vessel to a destination? But Heavenly Mother and Father are gone. You look around for them when suddenly a boat appears. It’s seaworthy and a little on the small side, but it looks like it will get the job done. You hop in the boat and start on your journey back to Heavenly Mother and Father, picking up your brothers and sisters along the way. So far, everything is going great. You’ve gathered a sizeable crew of your brothers and sisters who are also excited to return home, and every day you’re inching closer to your destination. Then one day, one of your brothers brings you some frightening news. “Replace the hull? You can’t just replace a divinely-made hull! God made that hull, and if you replace it, you’ll be ruining the divine design of the boat!” your brother protests. So you decide to speak with Heavenly Mother and Father about the hull, and ask them whether or not it’s okay to replace it. “Oh, that makes sense,” you say. So you return to the boat and repair the hull and go on your way. You’re still on your journey home, but now there’s a new problem: there is not enough room on the boat. In fact, there are so many people wanting to get on the boat that there isn’t room for everyone who wants to get on. You discuss this problem with your brothers and sisters and ask them for a solution. There are two camps. The first believes that the size of the boat should not change because it was a divinely-created boat, and that because the boat was created small, it means that Heavenly Mother and Father only want a small portion of their children to return to them. The second camp believes that just like the hull was replaced in order to facilitate the journey, the boat can be built larger in order to accommodate more people on the journey back home. Again, you take the problem to Heavenly Mother and Father. “If I remember correctly, the mission we gave you was to get as many of our children as possible to return to live with us someday. The boat was given to you only as aid to assist in that mission; it is not the purpose of your mission. Boats are easy to replace. Our eternal children are not,” says Heavenly Father. Sufficiently humbled, you return to your brothers and sisters and tell them that you have been commanded to expand the boat. Most are elated by this news and quickly volunteer to help with the construction. But a few are noticeably upset. They are more concerned about maintaining the boat’s status as a divinely-created, unalterable vessel than they are about the mission of returning to Heavenly Father and Mother. When you begin working on expanding the boat, they quietly leave. First off, this is a unique and well-written way to express your perspective, and I’m glad you shared it. But while the allegory is nice, what’s really happening right now might be better represented by a different one. Our Heavenly Parents have indeed made a boat for us to assist in our journey home, but it is one of a suitable size for all Their children and made of materials which cannot degrade. Some additional features will be added part way through the trip, but these are part of Their plan and the materials are stored in the Captain’s chambers with the appropriate blueprints. The design of this boat is unconventional to many and some you encounter on your journey refuse to board. Some think it not seaworthy or its accommodations uncomfortable. Others find they don’t like some of the crew. Interestingly, this particular boat, with its peculiar design, is the only one that can make the journey with which you have been tasked. The mistakes of its crew (even some high-ranking crew), while potentially frustrating, can by divine design do nothing to prevent the eventual successful conclusion of your trip. Out of honest concern for those you meet, you stop periodically on your journey to counsel with your Heavenly Parents and express that perhaps if the ship’s design were altered, more would be likely to board. You tell Them that you sometimes feel uncomfortable on board, too. They tell you They love you and patiently explain that they are glad you are making efforts to solve this frustrating problem, but remind you that this boat alone is uniquely suited to your mission exactly as constructed, and that the Captain will know when to change course. They do, however, promise you that They will do everything They can to convince as many people as possible to join you in your journey. Because of how beautiful the journey has been, you feel terrible that some will miss out, and protest again that you really should make a few changes. Your Heavenly Parents counsel you to do everything you can, but ultimately to trust in the plans They have made, as they know the waters far better than those on the journey. They explain that only those who put their full trust in Their plan will ultimately be able to arrive at your destination. But They promise to do everything They can to help you understand and feel better. Again, I appreciate having read your perspective. I simply think you have underestimated how well planned this journey is, even if the boat looks strange, and how much trust has been rightly placed in the Captain and crew, even if they drive you crazy sometimes. Best wishes on your personal journey and in receiving guidance from those who have planned it. You don’t need an allegory, you have The Brother of Jared. Sometimes, more often than not in my experience, we are forced to come up with a plan and take that plan to The Lord. “Touch the rocks”. I am also curious if you pray specifically to Heavenly Mother. I would hesitate in the practice because of the Savior’s admonition to “pray to the Father in my name”. It’s always best to turn to scripture on matters of doctrine and practice. My other thought is: God will not suffer His children to be lost. The ship may sink, the captain may be prone to error, but The Lord God of Israel is ever mindful of His flock. As we trust in Him our journey home will never be jeopardized. This is a well written piece. It is thought provoking and stimulating. Please continue to blog on these topics, it is much needed. This is beautiful. I think you really summed it up perfectly. I might have to borrow this metaphor some time. this is beautiful. I wish I believed brother Eyring’s words were being honored in the church (by lay members and leaders) today. The church most certainly is a vessel, but its the only vessel. When you recite the 9th article of faith, we believe all that God has revealed and all that he does now reveal, and will yet reveal many things, you imply the hope that he will one day reveal that women will have the priesthood. Well my question is if we are close to the second coming, and God has had the entire span of history to reveal what you have been hoping for, why has he not done it? Ultimately Im asking, what do you hope to accomplish with having the priesthood, besides what you view as equality? I’ve begun to explore different religions, and in all have decided that (And this is my personal belief, my opinion, just mine) all churches in our world are simply vessels, and that there is not a single one that has all of the answers. Different people find different churches that they feel comfort them, and that’s great, there are so many to choose from! But in the end, they are all just vessels that will try to get us as close to God as they can.